View cart “Portax K WCF 2019 19-023” has been added to your cart. 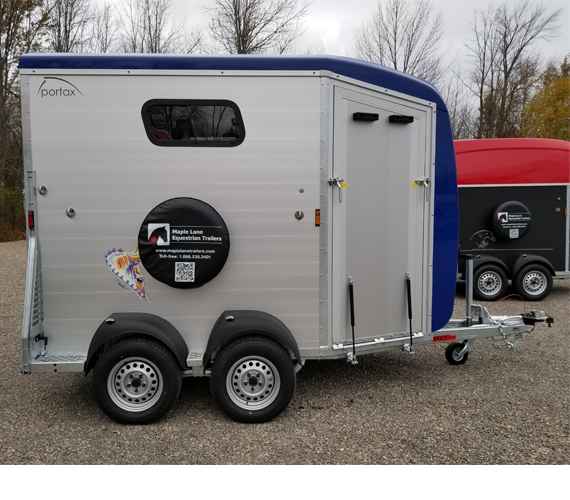 This 2019 Böckmann Portax SKA-Flame Red Polyester Roof and Front Bow is the Perfect Trailer for heading to shows, clinics or trails. 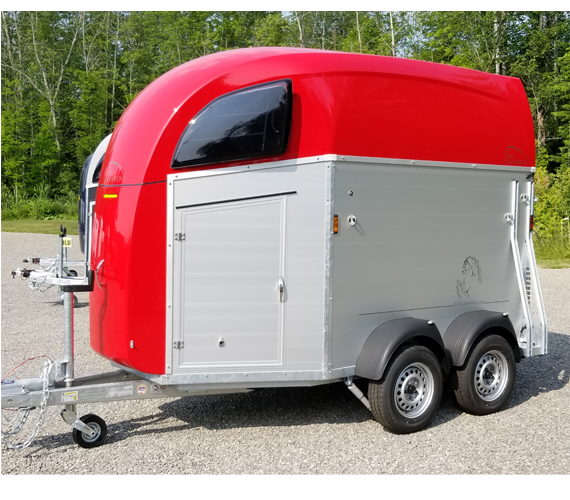 The Portax SKA-Flame Red – marries the cupboard idea of the Big Master with more convenience in the swivel out saddle racks that hold both Western and English saddles. The Portax SKA-Flame Red – lets you access your saddles from the external cupboard door, and bridles, grooming items etc, from the inner stall door. Perfect for a rainy day! The SKA version will accommodate the 18hh warm blood, but also benefits the larger QH cross used for trail or cattle sorting. Need a trailer you can have alongside the event field- this is a great choice! 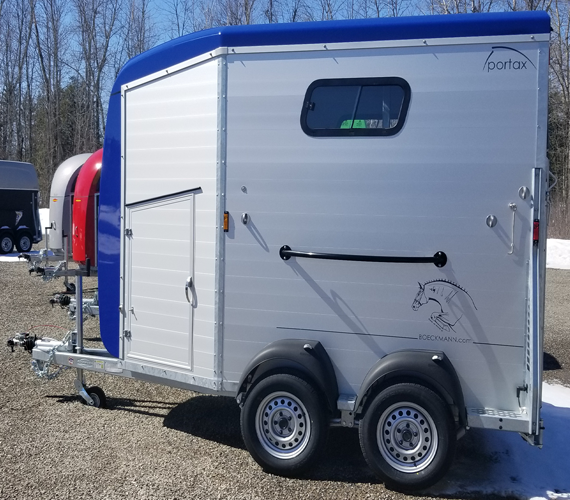 A panoramic front window for the horses, a roof vent that draws in the air, lateral sliding windows and the rear canvas various settings, all control the rate the air exits the trailer. 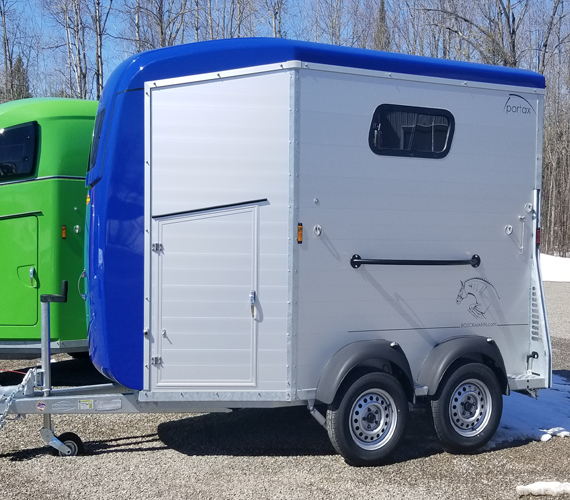 Anodized aluminum extruded panels that enclose an insulating air pocket will keep your horses warm in cool weather and cool in summer. The aluminum panel floor also prevents road heat from cooking your horse in the summer. A rubber mat is entirely glued to the floor and sealed at the walls to prevent mold growth. The polyester roof reflects the sun’s heat, and offers the flashy colour options such as this Flame Red. The robust galvanized steel chassis provides strength and durability. Most favorite feature is the rear Door-ramp combination. You can switch from rear ramp entry to a step-up with the pull of a pin! The integrated rubber safety treads on the rear ramp prevent horse or rider slipping during inclement weather. Release the stall bars from outside the trailer using the MSS external release system, in the event of an emergency. Trailer tie rings, hay net hangers, lots of light and air allow you to create a safe comfortable space for your horses. The bright white interior leaves no dark corners, creating a welcoming space. 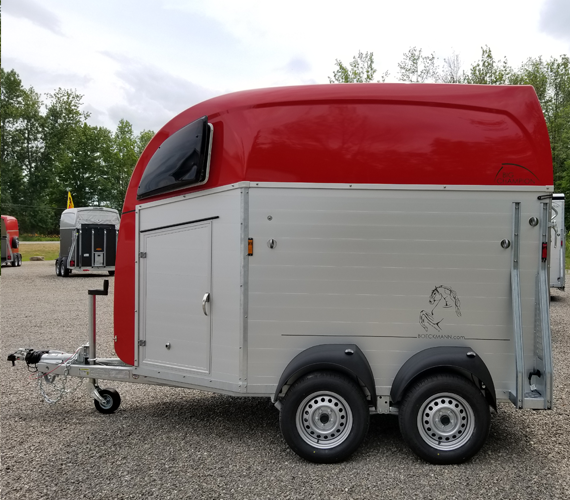 The 7’7″ internal height keeps an open feel to the trailer. The stall bars are easily adjustable to tailor the stall length to suit your horse. Each stall central panel can swing left or right to increase the entry for the first horse loaded. Or swing away a panel and tack-up on the trailer. The WCF Suspension is at the elite car standard – rare to find on a horse trailer! Coil spring suspension connected to trailing arms with rubber dampers and added shocks mean your horse has a smooth ride! Leave the road chatter at the road and reduce trailer fatigue with the WCF suspension trailers. WCF-Plus shock/coil spring suspension system. 1 Groom/Escape Door to the Curb side. SKA Saddle chest accessible from outside the trailer as well as from the stall. Swiveling saddle racks that can be locked into position, hooks, blanket bar, mirror and small storage net.